No Stress is a connected object for the surveillance of your children in case of drowning risks. 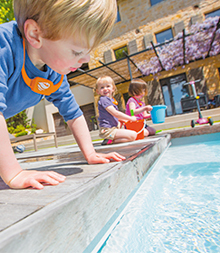 Using No Stress, your smartphone becomes your surveillance ally for children in case of drowning risks. No need for GSM network, 3G or WIFI, No Stress creates its own network locally. Don't have a smartphone? Or want surveillance using an item that can be dropped? The No Stress Lighthouse quite simply replaces your smartphone. • it organises selective surveillance and does not mix up children, even if several No Stress beacons are operating in the same area. next to a river, at the beach, in fresh water and salt water, etc. • As a wristband (small bath allowed). • As a necklace (playing in water with peace of mind). • As an ankleband (access to water not authorised). With the No Stress free app installed, your smartphone can monitor up to 6 Beacons at the same time. If you do not have a smartphone or its battery is flat, the Lighthouse can replace your smartphone.